I took a short walk to strech my legs after sitting all day. I brought my small Moleskine watercolor sketchbook and Lamy pen. The intention was to find a place to sit down and make a quick sketch of something interesting. But since I'm not completely comfortable sketching having people around me, it is tricky to find such a place. There are a lot of old beautiful buildings in the neighborhood of my office and I ended up on a bench not far from a childrens playground. So at the sound of childrens play I drew this house. 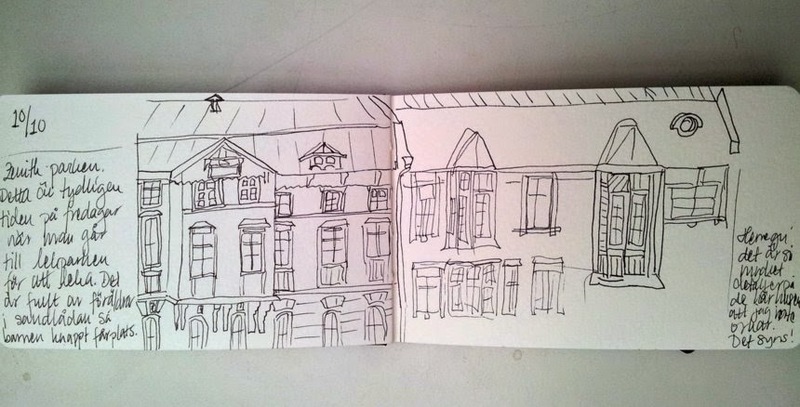 There are so many intricate details of these houses so I really got tired of drawing it. And it shows. The left hand page has more detail, that is where I started out. On the right hand page I wished the page was even smaller than it is. Three little friends from the playground came over to my bench and the girl in the company asked me what I was doing. I told her I was drawing. She looked at my drawing and asked me if I like houses. I said yes, but in my head I said no. I guess I wasn't lying to her. I like houses it is just that drawing houses might not be my thing.